Winter is right around the corner, and drivers are going to have to get their vehicles prepped for the cold. This may include parts of your regularly scheduled maintenance, or it may include some basic repairs you have been putting off. Either way, your local service experts at Van Isle Ford Sales have put together a list of components you may want to check before the weather gets too extreme. Winter car care is rather simple. If your car is in good condition, then all you really need to do is check up on everything. If you have been putting off some basic maintenance and repairs, then now is the time to get things up and running. Don’t let yourself get stuck in a winter storm without being properly prepared. Take the time now, so that you can relax a little when the harsh weather hits. The following is a list of components that you will want to pay attention to before it becomes too late. · Tires- Your tires are one of the most important safety features this time of year. They allow you to travel through winter driving conditions, and give you the control you need when the roads are slick. Make sure you have appropriate tires for the climate in your area. Also make sure that you have thick enough tread to last through the season, and that the tires are properly inflated. 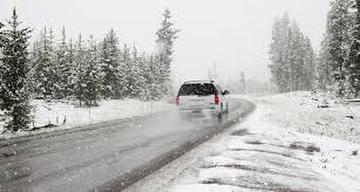 · Brakes- Check to make sure your brakes are prepared for the snow. You should have your brake pads inspected, and check to make sure your brake fluid is full. This is also a good time to check that your parking brake is working, so you can have it repaired or adjusted if needed. · Cooling System- Check to make sure that your coolant is topped off, and that your cooling fans are working. You do not want to run out of coolant or not have enough anti-freeze in your coolant mixture. This is what keeps the engine from freezing during cold nights, and it only works if the system is kept at proper levels. It is also necessary for the heater in the vehicle, as hot coolant is what warms up the heater core. · Heater/defrost- Turn the heater on full blast and check that it is working on all settings. On full blast, the heater should make you uncomfortably hot after 10 minutes or so. This is by design, so that you do always not have to run the vehicle with the heater on full blast. Also make sure that defrost setting is working, which uses the air conditioning system to dry out the air on the windshield. · Windshield wipers- Make sure that your windshield wipers are not leaving streaks or missing sections of glass. Also make sure that they function on all settings and speeds. Wiper blades are designed to be replaced, and you may need to do so before you get caught in a storm. If the wipers are not responding to the switch, you may have an electrical or mechanical issue that needs to be addressed. Now is the time to get these repairs done, so you don’t have to worry about it when winter hits. · Lights- Check that all the vehicle’s external lights are working. Verify that your blinkers, hazards, headlights, high beams, brake lights, reverse lights, and parking lights are all functioning. Replace any bulbs or having any needed electrical work done before it becomes an issue when visibility is poor. The goal of winter car maintenance is to prepare your vehicle for the next few months. You want to head into the holiday season knowing that your vehicle is ready for the roads ahead. Your local experts at the Ford service center in Port Alberni are here to help. We service all makes and models, as well as have the top Van Isle Ford Sales team to help with any new purchases.